Our small Personalised Name Wall Decal is 56cm so it can easily be placed on your child’s bedroom door! Choose from 10 fonts and 18 colours. Free gifts too. 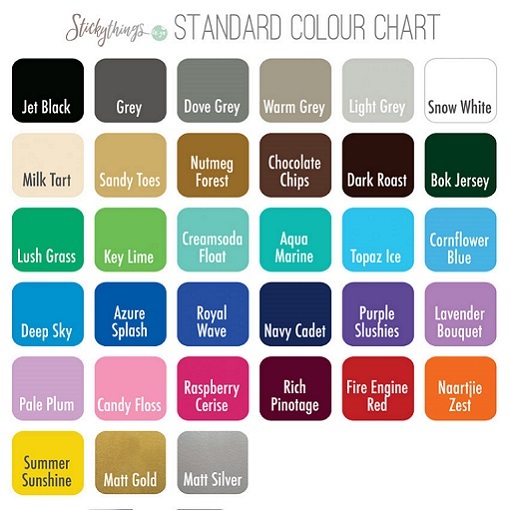 Our Personalised Name Wall Decal is custom made for you in Jet Black, Grey, Dove Grey, Warm Grey, Light Grey, Snow White, Milk Tart, Sandy Toes, Nutmeg Forest, Choc Chips, Dark Roast, Bok Jersey, Lush Grass, Key Lime, Creamsoda Float, Aqua Marine, Topaz Ice, Cornflower Blue, Deep Sky, Azure Splash, Royal Wave, Navy Cadet, Purple Slushies, Lavender Bouquet, Pale Plum, Candy Floss, Raspberry Cerise, Rich Pinotage, Fire Engine Red, Naartjie Zest, Summer Sunshine, Matt Gold, Matt Silver or Mirror Metallic Rose Gold. Want it just like the Main Photo? The main photo of our Custom Name Decal is Fancy Pants Font in Raspberry Cerise. Kids Type, Modern, Cursive Style, Roman, Typewriter, Neat Modern, Curly Sue, Fancy Pants, Monkey Font or Playground. Click here for more on our Fonts. If spaced like main photo, the small Personalised Name Decal measures approx. 56cm across. The height of the letters will depend on the number on letters (see below). Be aware that depending on which font you choose and the number of letters in the personalized name, the height of the name will vary. The more letters there are, the shorter in height the word will be. The width of whole name is 56cm so for example: in Playground Font – Sam will be 56cm x 22cm high, whereas Samantha will be 56cm x 9cm. – Personalized Name (56cm across) – we recommend less than 12 letters. – FREE: 14 Dots (3cm each) in same colour scheme. – You always receive: a practice wall art sticker, step-by-step wall decal instructions plus sticker specific design instructions. Our Small Personalised Name Wall Decal is quite versatile as you can stick it almost anywhere. The colours match almost all of our other wall decals and this small personalised name wall decal has specifically been designed to be 56cm across so it can easily be placed on your child’s bedroom door! This personalised decal does not have to be used for a first name – we have had many orders for surnames, house names (caravans too!) or house numbers and even one for city names under time zone clocks. Choose from 18 Colours and 10 different fonts. And: Get 14 dots (which can be placed separately but also in a line underneath the name) in in same colour for free! Difficulty Level: 3/10. Very detailed instructions included, all our stickers are designed for first timers – so don’t worry. We received the stickers today. We absolutely love it!! Thank you very much!! Die stickers is ‘n groot sukses!